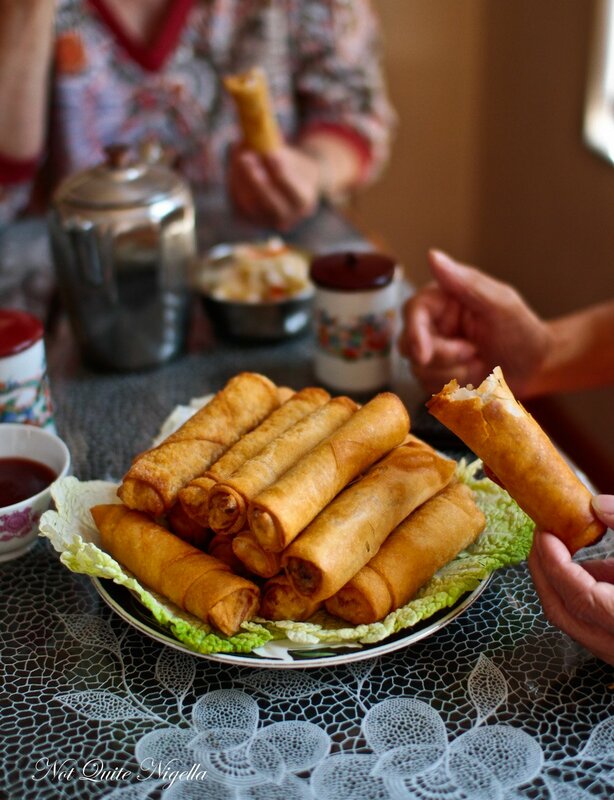 A Dear Reader Request: My Mother's Spring Rolls! 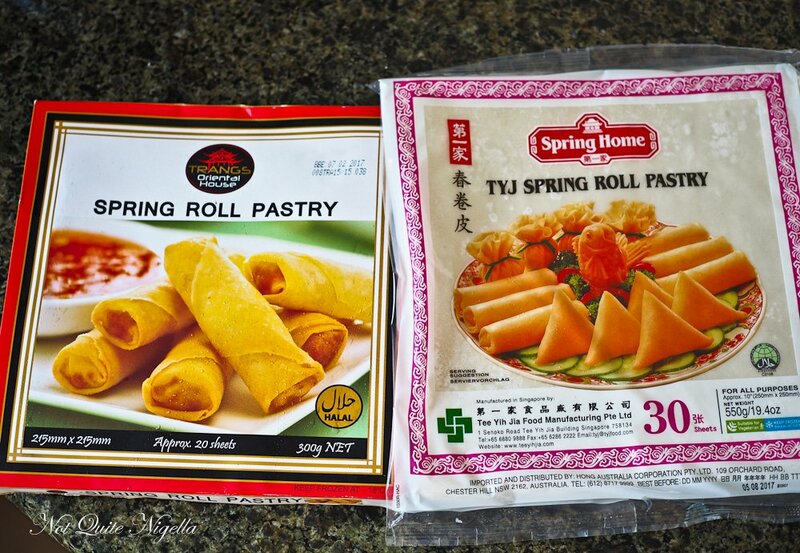 These spring rolls would have to be some of my mother's most popular items. They were fed to me as an after school snack and have had a place in my heart ever since. 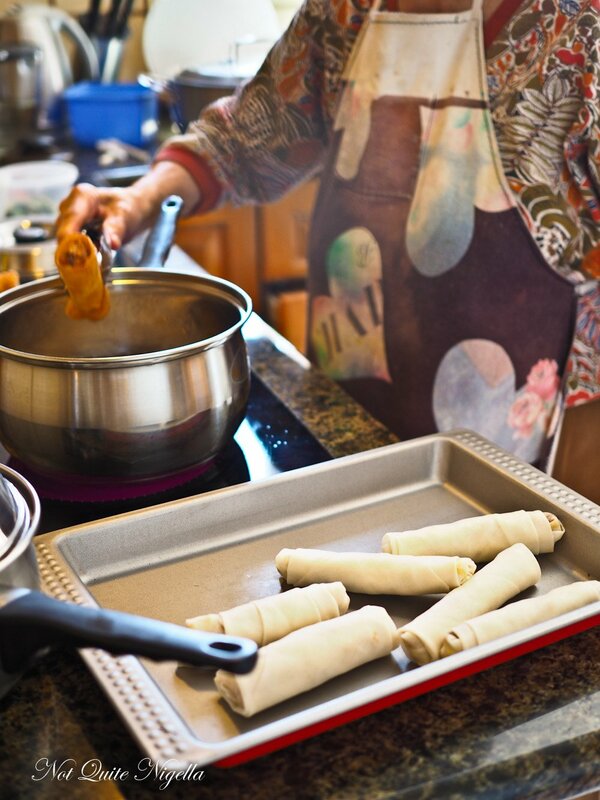 Today my mother reveals her secret recipe for the perfect spring roll! 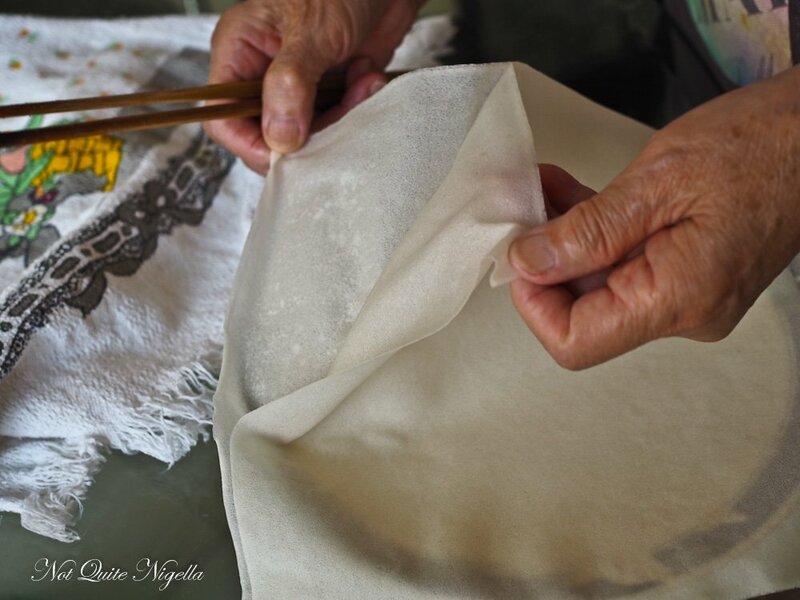 My mother and I were rolling up spring rolls when she told me about my grandmother. There was one thing my grandmother loved and that was people that were fattened up and chubby. Ironically she was reed thin and every day after school she would cook us up a batch of spring rolls. Well you can imagine how much weight we put on but we loved these after school treats. 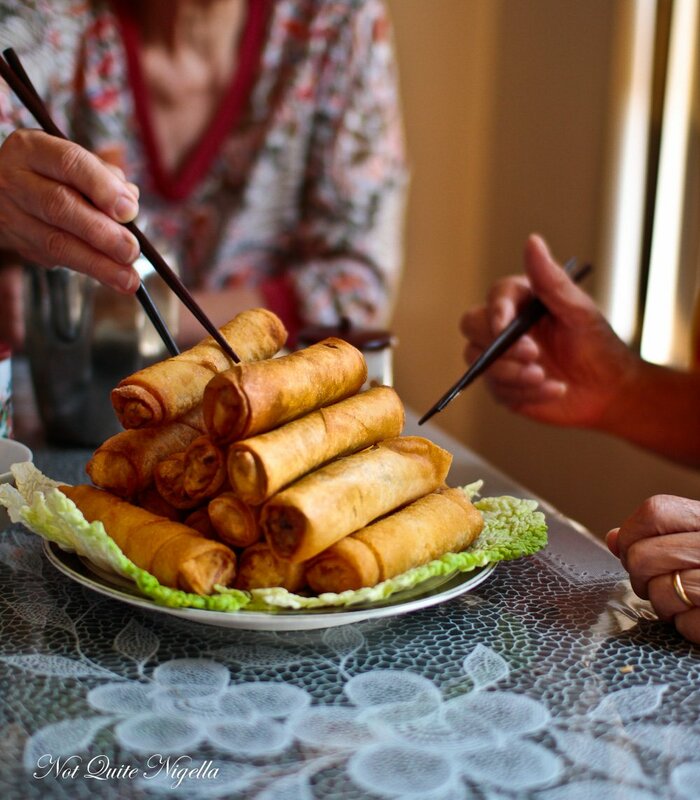 My mother and grandmother's versions of spring rolls were usually made with dumpling wrappers, those small squares that you make dumplings in rather than the larger, thinner and semi translucent ones. I asked my mother why this was and she said that it was merely because she always had dumpling wrappers in the freezer. Nowadays we make them with spring roll pastry as it is crisper while the other ones tend to soak up a lot of oil. The filling is the same though and it is a beauty. It's a flavoursome, mostly vegetable based mix of ingredients and these taste great even without the meat in it. 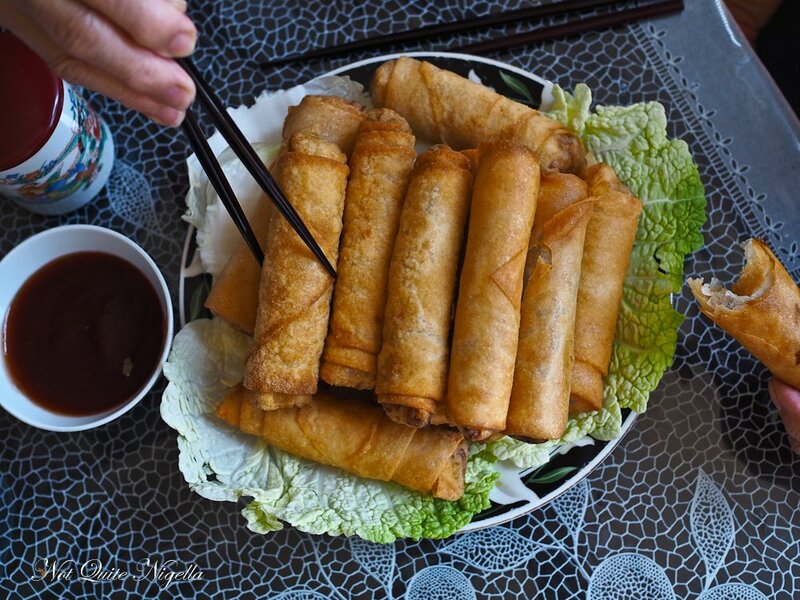 The secret to spring rolls is about the right way of rolling them up. This allows the outside to crisp up beautifully golden so that you hear the crunch in your ears while the pastry shatters on your lap. All the while keeping the inside luscious. You don't like deep frying? That's fine, you can also bake them (although they do taste better deep fried). Oh and this is a reader request from a Dear Reader called Belinda. As it is almost Chinese New Year (Monday the 8th of February) and I thought what better time to make spring rolls than now? Every year my mother reminds me when Chinese New Year is because of course it changes every year because of the lunar calender. I'm not great at keeping up with that and my parents have never quite understood me. I've written in my book that they have always looked at me from a distance, arms crossed perhaps checking my label on my back to see which planet I fell from. I am of course the odd one out in our family, a title that I happily enough claim. My mother regarded me recently and asked, "Where did you love of cooking come from?". I assumed that it came from her but she shook her head. For my mother and two grandmothers, cooking wasn't a pleasure. It's something that you did to feed the family and was merely another thing to add to the enormous list of duties. One of the first thing my father's mother did when she got married was to hire a cook. Whereas I would be at most at home in the kitchen! So tell me Dear Reader, where do you get your love of cooking or eating from? What was your after school snack? And are you eating anything special for Chinese New Year, the year of the monkey? And do you have any recipe requests? Step 1 - Mix the chicken or pork with the cornflour, salt and sugar. Set aside. Step 2 - Heat some oil in a wok or frypan pan and fry the beaten egg into one giant flat omelette. Remove from the pan and cut into slices and cool. Then add some more oil and fry the onion for a couple of minutes. 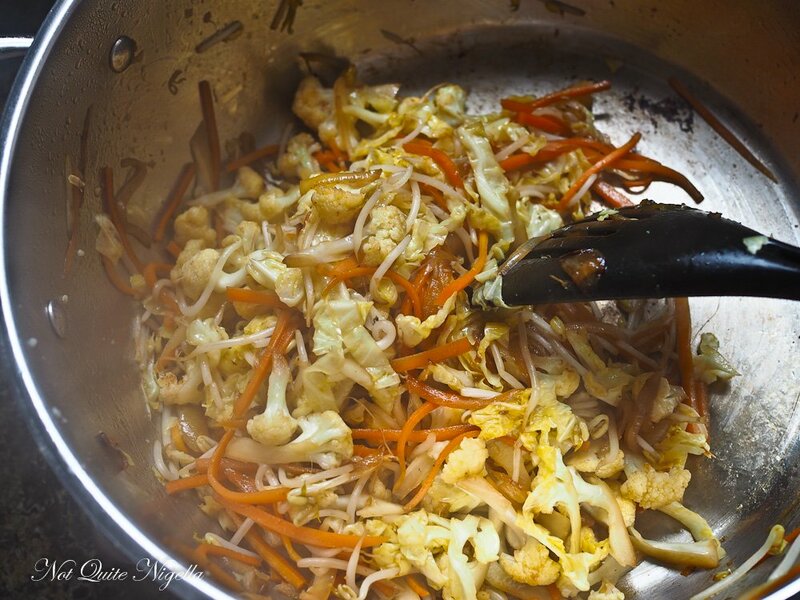 Then add the seasoned chicken or pork, cauliflower and carrot and fry for 2 minutes then add the bean sprouts and cabbage for fry for a minute. The chicken should be cooked through. Taste for seasoning and add salt if you need to. Mix everything together and allow to cool. 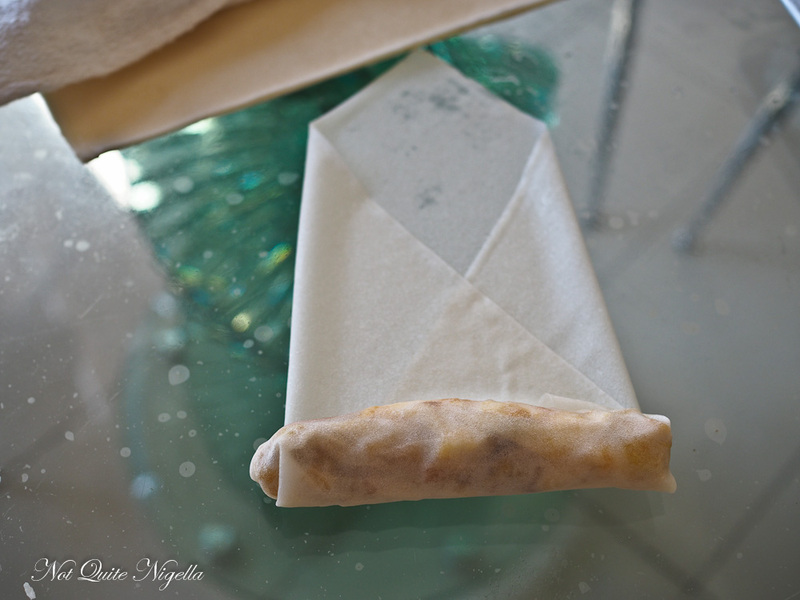 Step 3 - Once the filling has cooled remove the spring roll wrappers from the plastic and cover with a tea towel. Have a tray ready to place the wrapped ones along with a tea towel to cover those. Have a small bowl of water ready to seal the end of the spring roll. 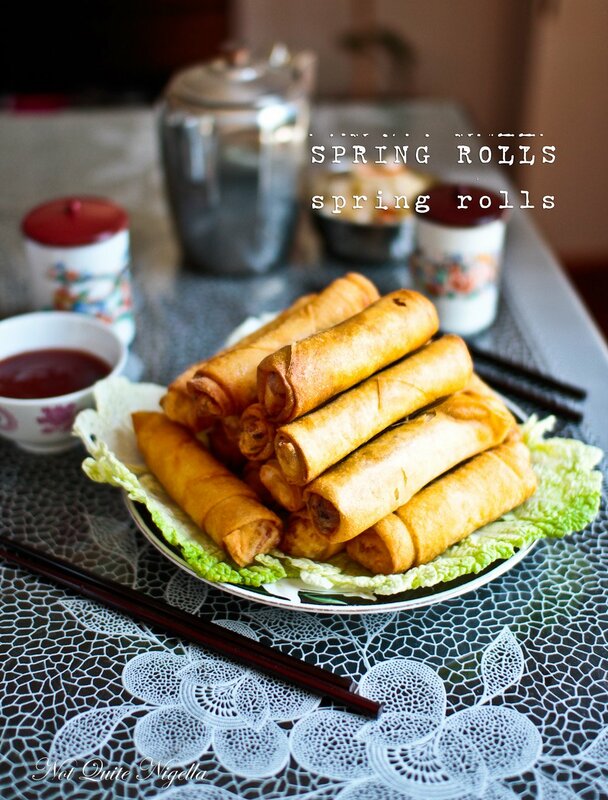 Step 4 - Rolling spring rolls the correct way and not overfilling gives you gorgeous, crispy golden spring rolls. Place the pastry in front of you smooth side down with a pointy side facing towards you. Place a little bit of filling in a rectangular shape towards the bottom as shown. It's important to keep the filling quite tight in the roll so use the pastry to pull back on the filling and to shape it into a log. Roll until almost half way and then fold over the sides and roll to the end securing the pastry with a dab of water. Place on the tray and repeat until all of the filling is used. Deep or shallow fry in a wok or deep fryer. Serve immediately with sweet and sour sauce. 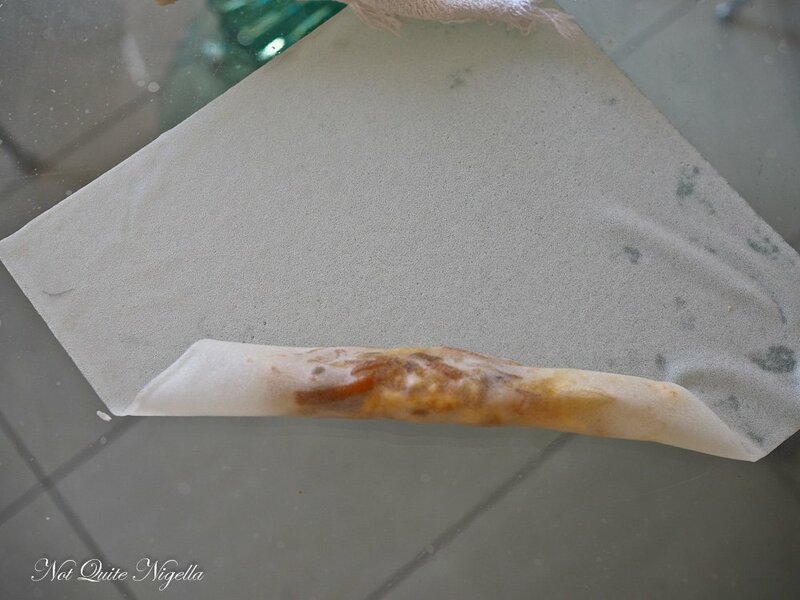 Baking instructions: Place the spring rolls on a parchment lined baking tray and brush with oil on both sides. 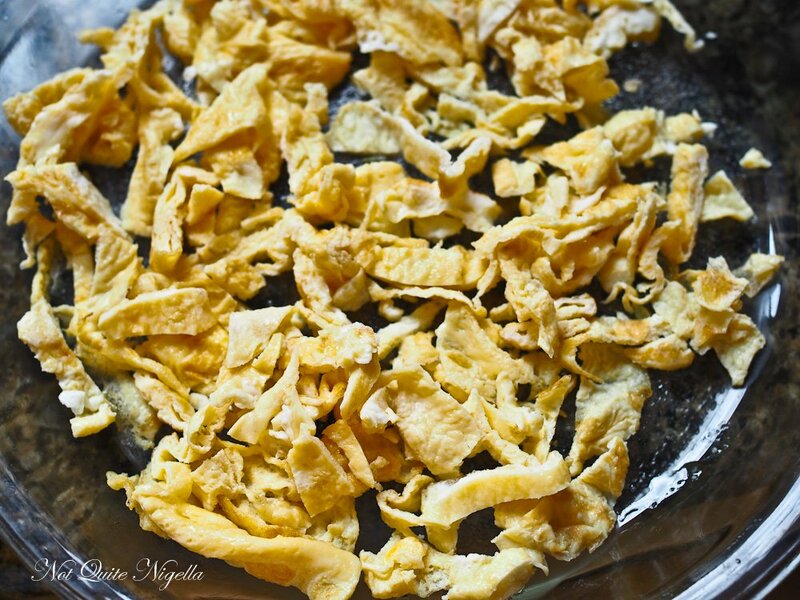 Bake at 200C/400F for 20 minutes or until crisp.